Sendak, Maurice. Very Good. Chicken Soup with Rice: A Book of Months (The Nutshell Library) by Sendak, Maurice, 2007-02-03. Trade paperback (US). Picture book. Glued binding. 32 p. Contains: Illustrations. Intended for a juvenile audience. Sendak, Maurice. Very Good. Chicken Soup with Rice: A Book of Months (Nutshell Library) by Sendak, Maurice, 1962-11-28. Library binding. Cloth over boards. With dust jacket. 30 p. Contains: Illustrations. Nutshell Library. Intended for a juvenile audience. Sendak, Maurice. Good. 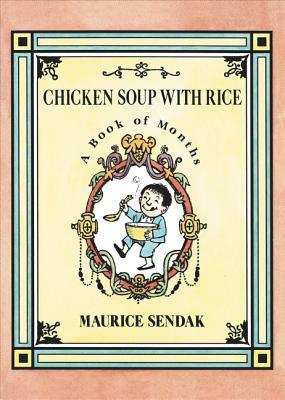 Chicken Soup with Rice: A Book of Months (The Nutshell Library) by Sendak, Maurice, 2007-02-03. Trade paperback (US). Picture book. Glued binding. 32 p. Contains: Illustrations. Intended for a juvenile audience. Good jacket. Ex library copy with the usual stamps and marks and stickers. A good firm binding and clear text. Good bright content. Good condition is defined as: a copy that has been read but remains in clean condition. All of the pages are intact and the cover is intact and the spine may show signs of wear. The book may have minor markings which are not specifically mentioned. Most items will be dispatched the same or the next working day.